U.S. Transportation Secretary Anthony Foxx unveiled a long-term transportation bill he is sending to Congress for consideration as the House and Senate face looming deadlines to avoid the economic uncertainty and job loss that would ensue if the Highway Trust Fund runs out of money this summer. The “Grow America Act” reflects President Obama’s vision for a four-year surface transportation reauthorization bill that would create millions of jobs and lay the foundation for long-term competitiveness, rebuilding crumbling roads and bridges while providing much-needed certainty for local and state governments and addressing the country’s future needs. In February, Foxx joined President Obama to announce a plan to address the nation’s infrastructure deficit with a $302 billion, four-year surface transportation reauthorization proposal. As outlined in the FY2015 budget, the plan will invest in our national infrastructure network, increase safety and efficiency, and provide greater access to ladders of opportunity, all without adding to the deficit, by relying on the President’s proposed pro-growth business tax reforms. Addressing the shortfall in the Highway Trust Fund and providing an additional $87 billion to address the nation’s backlog of deficient bridges and aging transit systems. Creating millions of new jobs to ensure America’s future competitiveness. Increasing safety across all modes of surface transportation, including increasing the civil penalties the National Highway Traffic Safety Administration can levy against automakers who fail to act quickly on vehicle recalls. Providing certainty to state and local governments that must engage in long-term planning. Reducing project approval and permitting timelines while delivering better outcomes for communities and the environment. Bolstering efficient and reliable freight networks to support trade and economic growth. Earlier this month, Foxx traveled across the country on his “Invest in America, Commit to the Future” bus tour, with visits to manufacturers, bridges, freight facilities and highway projects to raise awareness of America’s infrastructure deficit. 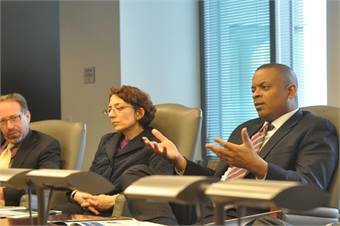 Foxx met with business leaders, stakeholders, and members of communities to discuss the projects that work, projects that are needed and to ask them to commit to a future with an American transportation system that’s second-to-none. In the face of current uncertainty of federal transportation investment, many states have postponed or canceled needed transportation projects altogether. The Highway Trust Fund, which provides most of the federal support for state transportation projects, is on track to start bouncing checks as early as August. In January, the U.S. Department of Transportation began posting a ticker online so the American people can track the remaining funds. To view the ticker, click here.